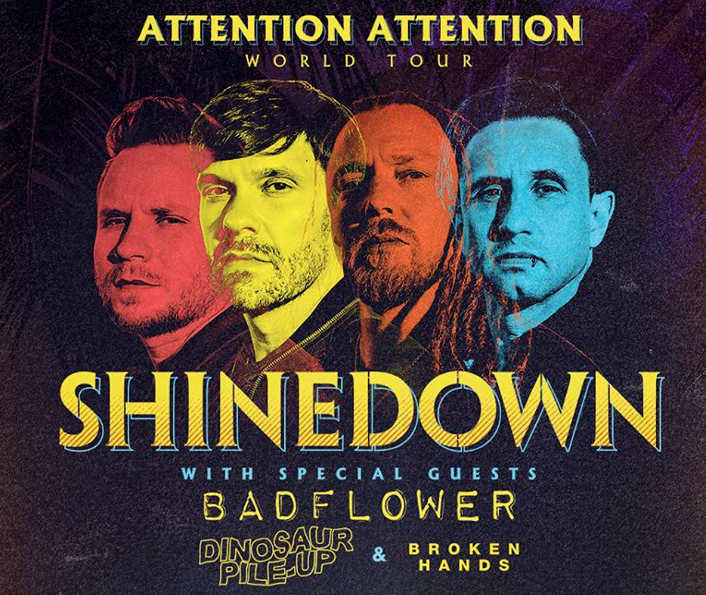 Shinedown has added 2019 world tour dates in conjunction with their latest studio LP, Attention Attention. Shinedown will begin a North American tour with Papa Roach and Asking Alexandria later this month before heading out on a solo headlining U.S. tour in May. The newly announced concerts with opening acts Badflower, Dinosaur Pile Up, and Broken Handsare are scheduled to begin in June with the bands performing at mostly outdoor amphitheaters. Stay tuned, we will be updating this page if additional concerts or information becomes available. 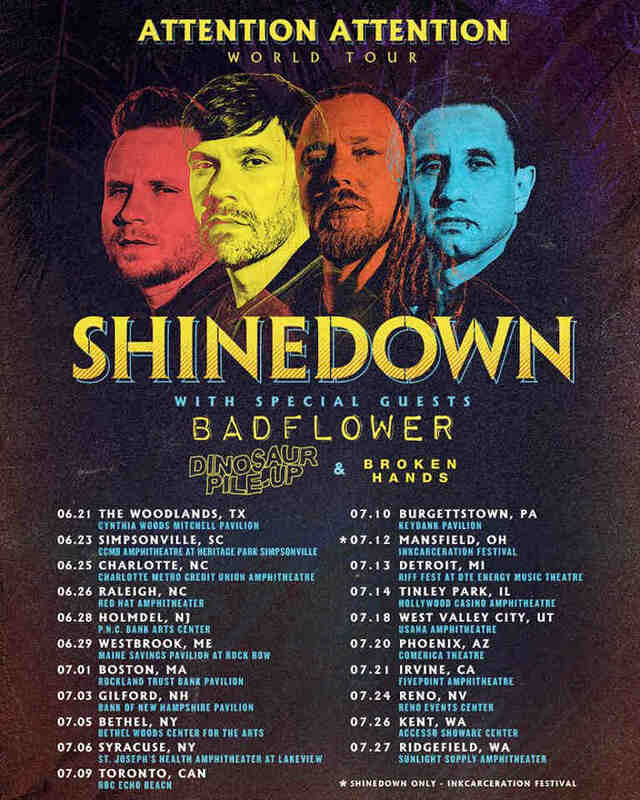 When do Shinedown 2019 tickets go on sale and what is the presale code? The general public on-sale begins as early as February 8, 2019. Presales for fan club members, VIP packages, and Citi cardmembers will begin on February 5. Live Nation, LN Mobile App, and local venues / radio presales will follow. For the Citi cardmember presale you can use the passcode 412800, but you'll need the card to complete your purchase. The Live Nation presale offer code for February is SINGLE and the LN Mobile App code is COVERT. Keep in mind, each date is different and details are subject to change. Click on the individual concert links for more information about the show you're interested in. We recommend following Shinedown on social media and signing up for their free email newsletter (bottom of page), in addition to checking your local venue’s social media and email subscription service, to get the most up-to-date information. Attention, Attention is available on Amazon and most major streaming services. For more music, news, and tour dates, check out Shinedown's Zumic artist page.